Geneva, February 21, 2019 - STMicroelectronics (NYSE: STM), a global semiconductor leader serving customers across the spectrum of electronics applications, is driving safer, smarter automotive electronics and advanced domain controllers with the introduction of its new Stellar automotive microcontroller (MCU) family. The Stellar MCUs support next-generation car architectures, which rely on broad "domain controllers" for areas such as Drivetrain, Chassis, and Advanced Driver Assistance Systems (ADAS). These domain controllers enable the transition toward software- and data-oriented architectures by providing data fusion from connected sensors while reducing harness complexity and electronic-component weight. 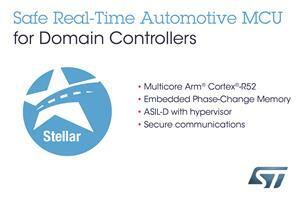 The Stellar family is a technological breakthrough for automotive microcontrollers. Combining the advantages of 28nm FD-SOI, on-chip Phase Change Memory (PCM), advanced packaging, and multiple Arm Cortex-R52 cores, the Stellar family can operate at frequencies up to 600MHz and integrate more than 40Mbytes of PCM while minimizing power consumption even in harsh, high-temperature environments. Stellar MCUs are manufactured in-house in ST's 12'' Crolles facility. Major applications for Stellar MCUs include smart control for hybrid powertrain, the broad electrification of car systems with on-board chargers, battery-management systems and DC-DC controllers, as well as smart gateways, ADAS, and enhanced Vehicle Stability Controls. ST is now sampling the first Stellar MCUs, which feature six Arm Cortex-R52 cores clocked at 400MHz, 16Mbytes of PCM, and 8Mbytes of RAM, all in a BGA516 package. Stellar-based control units are currently undergoing road tests with lead customers. "Stellar MCUs deliver the safe, real-time performance required by new domain controllers that support data-enabled services - an industry that will reach $1.4 trillion in 2030," said Marco Monti, President, Automotive and Discrete Group, STMicroelectronics. "Stellar MCUs are designed to support the new software-centric architectures that will enable this new revenue stream, where the functions of several control units are integrated in larger domains with the capability to remotely install new features without compromising automotive safety and security." The Stellar devices build on ST's extensive know-how and strong track record in high-performance automotive MCUs and will complement the successful SPC58 series to manage the next generation of electronic systems. The new MCUs feature unique innovations to ensure real-time performance and safety with the low power consumption vehicle designers need for lightness and economy. The first Stellar automotive MCU samples combine six Arm Cortex-R52 cores with embedded non-volatile memory for fast and deterministic real-time computing, free from the delays of non-integrated memories. Stellar satisfies the automotive industry's demanding ISO26262 ASIL-D safety qualification by extending the Cortex-R52 cores with lockstep capabilities. Then, to further enhance functional safety and reliability, Stellar features a hypervisor for software separation and memory protection. Bolstering the multicore Cortex-R52 performance, Stellar also packs three Arm Cortex-M4 cores with a floating-point unit and DSP extensions to provide application-specific acceleration. Stellar also leverages ST's advanced embedded Phase-Change Memory (PCM), which is compliant with AEC-Q100 Grade 0. Safe and rugged, the 16MByte PCM assures performance, data retention up to 165°C, and supports Software-Over-The-Air to manage multiple firmware images. The convenient eMMC and HyperBus(TM) interfaces offer additional external storage. Stellar features a state-of-the-art Hardware Security Module (HSM) with EVITA FULL support and, by operating at more than 200MHz, Stellar is designed to maximise data throughput. The combination of HSMs with multi-bus routing across Stellar's wide set of automotive interfaces, including Ethernet, CAN-FD and LIN, provides the solution to the increasing requirement of OEMs for security and connectivity to their time-sensitive car networks. Stellar is supported by ST's partners already in, and applying to join, the ST Partner Program. These partners bring development tools (Arm, Green Hills, HighTec, Wind River), debugging tools (iSYSTEM, Lauterbach, PLS), and software (Elektrobit, ETAS, Vector). For more information, please contact your local ST sales office. EVITA: E-safety vehicle intrusion protected applications. A project co-funded by the European Union to establish an architecture for automotive on-board networks capable of protecting security-relevant components and sensitive data.